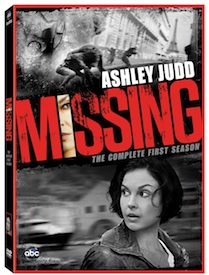 I am giving away ONE copy of ABC's "Missing" The Complete First Season on DVD. Want to win? Read the details below. After Becca Winstone’s son disappears while overseas for a summer internship, she takes it upon herself to travel to Europe to track him down.It soon becomes clear that Becca is no ordinary soccer mom but a former CIA agent deactivated after the devastating death of her husband. If she wants to find her son alive, Becca will have to rely on old friends..and old enemies, thus reopening old wounds. Her resourcefulness, skills and determination will be put to the test--but a mother's love knows no limits. Laura Donnelly (“Merlin”) and Keith Carradine (“Cowboys & Aliens”). (“Charlie’s Angels”) and Ben Brafman (“Person of Interest”). Missing: In Action – Viewers join Ashley Judd and executive producers Greg Poirier & Gina Matthews, as they look at the genesis and production of the international project. Audiences will get to see firsthand what it takes to shoot an international television production when the cast and crew show how they broke language barriers and borders on location in Turkey for 12 days. Deleted Scenes – Now fans can delve further into the “Missing” mystery with seven never-before-seen deleted scenes that include: Standard Delivery, Red Tape, No Escape, No Better Adventure, Close Call, Lock Up and Cornered. Send an e-mail to PopJunkieny@aol.com. Please include your FULL name and Date of Birth the e-mail. Put in the Subject "Missing Contest"
Contest is only opened to US RESIDENTS ONLY. Must be 16 yr and older to enter. Entries must be received by 11:59pm est on Wednesday June 20. ONE winners will be selected at random. Only ONE e-mail per person/ mailing address. Multiple entries will not be accepted. Winner will be contacted the week of June 25, 2012.